Web design Virginia Beach – Structural engineering firms. We are web designers in Virginia Beach, providing on-going website support and maintenance to keep websites fresh and up-to-date. After an initial redesign by an out-of-state website design company STROUD PENCE approached VISIONEFX to revise primary areas of their website to include; main photo animation, main navigation, bread-crumb and all the project galleries. 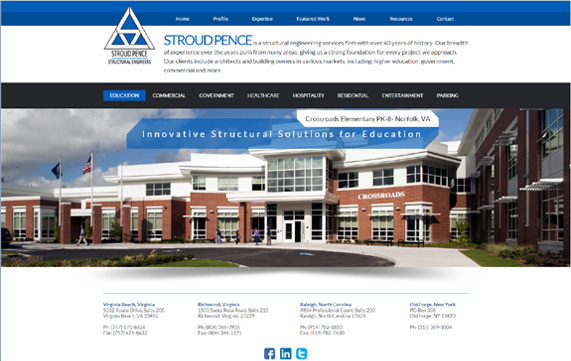 This is the 2nd redesign for Stroud Pence since becoming a VISIONEFX client many years ago. The framework is custom developed Word Press website content management system with enhanced security. The website is mobile friendly and has well-define area for important content, making it easy for first-time and returning visitors to browse the website. The website takes full advantage of the newer wide screen desktop monitor displays by filling the screen left-to-right. This provides the wow-factor when the home page appears on a visitors screen.